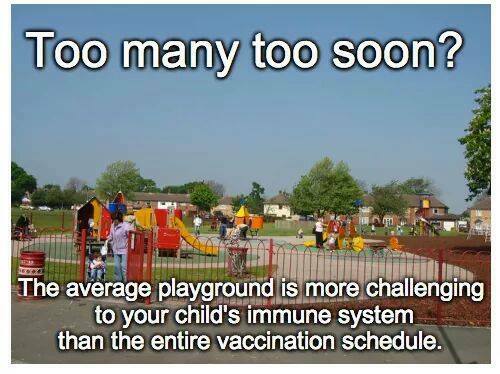 One of the most common concerns people have about vaccines is that their child is receiving too many vaccines too soon. This couldn’t be further than the truth! Your baby is exposed to more antigens (foreign things to the body) in their own bedroom at home than they are exposed to in a single vaccine! The body makes antibodies to the antigens we are exposed to so that we will know how to fight them off the next time that we are exposed to them. Here is an excellent response from Dr. Alison Schuman about the body’s response to antigens, or foreign material, in the body and how vaccines only contain a handful of antigens. Here’s a great video response from Dr. Paul Offit and Dr. Mark Sawyer explaining how the number of vaccines a child receives are not too many nor are they too soon. Previous Previous post: Q: Do vaccines cause autism? A: No.